From today 44 years ago, the person sent the first radio message (Arecibo Message) to the stars outside the Earth. Google has prepared Google Doodle of Arecibo Message while honoring this achievement. A Google Doodle of Arizbo Message looks colorful on the black background. 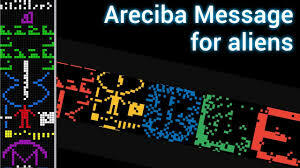 After clicking on the Google doodle on the 44th anniversary of the Arecibo message, the information related to Aricobo messages is revealed. It is said that the message that was broadcasted was very powerful, but till today the answer (Arecibo Message Reply) or say response message is not received. It is believed that some scientists had gathered in Aricobo Observatory located in the forests of Puerto Rico in 1974. This was the place where the Arecibo message was sent. For the information of the people, let me tell you that this radio message with less than 3 minutes used 1,679 binary digits. These binary digits are arranged in 73 rows and 23 columns. Let us tell that the goal of these series of numbers was that group of stars, which was located 25,000 light years away from the Earth. The Broadcast Powerful was because it used the 302-meter antenna megawatt transmitter of Arecibo connected with the antenna. Reminding the same achievement of the human being, Arecibo Message Google Doodle has been created. According to Google, the message sent will take approximately 25 thousand years to reach the target, then in such a situation, waiting for a message will have to wait. Nobody is aware of how long the response message will come. In 44 years, this Arecibo Message has reached only 259 trillion miles. It is expected that this one day will reach the people of Arecibo Message. Arecibo Message was conceived by Cornell University's Researchers team. Arecibo Message under the leadership of astronomer and star-physicist Frank Drake was prepared. On receipt of the message, information will be given about mathematics, human DNA, earth, and human information. On the occasion of the 44th anniversary of the Arecibo message, it can be said that only a part of the journey has been completed. It is expected that after 25,000 years, there is no answer.